To view our current inventory of antique sextants, octants, and other navigation instruments, click here! 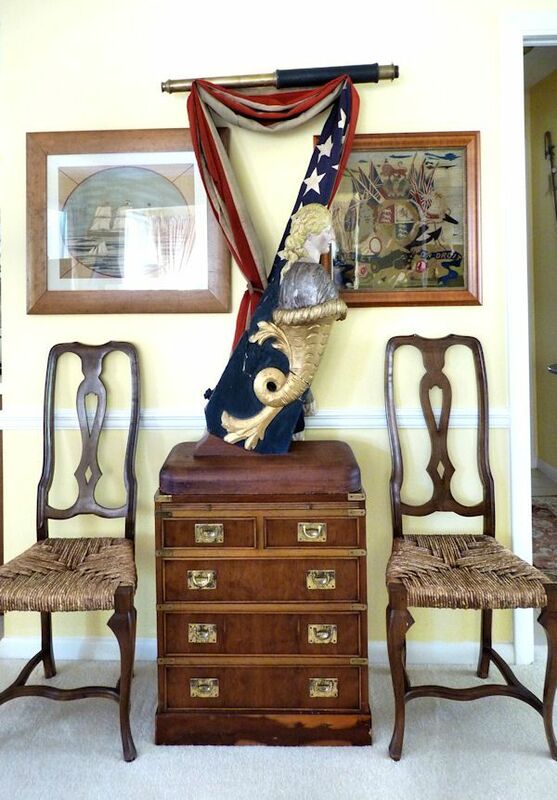 Unusual Front Focus Mid 19th century, erect standing, ship captain's single draw telescope with fancy rope work barrel and brass hardware. Bottom image as extended. 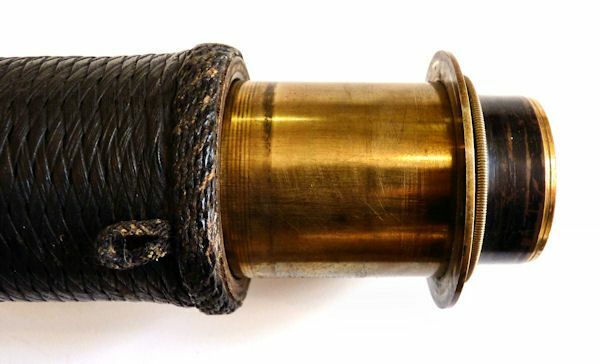 Presented is a finely made and extremely rare antique British single draw telescope designed with the focus done by extending the forward lens. It was likely used aboard ship by the ship's master. When fully extended, it measures 31 1/2 inches for comfortable use aboard a ship. The non-traditional brass hardware consists of a brass tube at the front extending 2" forward from the barrel which is 13 1/2" long. The rear tube measures 15 1/4" long. The front lens housing adds an additional 3/4". When closed the overall length is 18"
The clear colored objective lens is 27 mm in diameter, and when coupled with the 7 mm ocular lens, displays the image in an upright orientation. There is evidence that a dust cap was fitted over the front lens. The rear lens has the sliding style cover. SCARCITY: After an extensive inquiry of dealers in scientific instruments and with the chief curators of navigation instruments at museums in the United States and England, a single example of a "Front Focus" telescope dating to 1790, was discovered in England. Telescopes of this type are rarely found today and make a wonderful decorating item on a wall or resting on a long table. CONSTRUCTION: It's tubing is of heavy brass with finely knurled caps which join the metal work's threaded ends. The central tube is covered with seamless macramé with the ends finished with turks heads. The front tube extends forward and the rear tube extends aft with a joint half way its length. The front and rear lens are uncoated and are housed in screw in mounts. CONDITION: Expect to find the scrape marks where the draw tubes were pulled out and pushed in, and the natural marks of handling over 160 years. The brass is worn off in places and shows copper underneath. The appearance gives a lovely rich contrast to the instrument, and indicates this to be in its original, untouched condition. There are no scratches, dents or chips to the uncoated, erect standing, lenses. Overall, everything is in good operating condition on this well made antique scope. Telescopes of this type are rarely seen anywhere and this one belongs in a museum or collection of only the finest optical instruments. INSURED SHIPPING to 48 contiguous States $45.00.